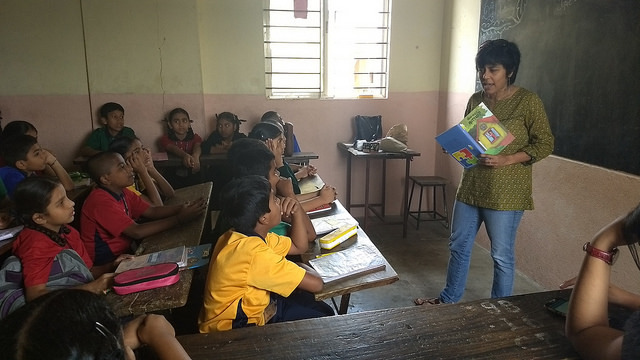 Zeba Imtiaz, Assistant Editor, Pratham Books writes about her experience at a recent storytelling session at Citizens High School, Bangalore. 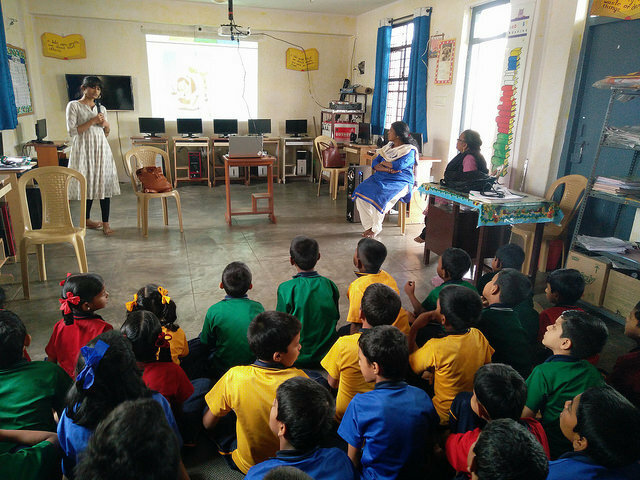 We recently accompanied Roopa Pai, author and editor of a formidable number of STEM books, on a story telling session at Citizens High School in Bangalore. The STEM books have been written and created with support from Oracle, and the event was organised with the help of our partner organisation - Mantra4Change. The intent of these sessions is to bring creators and readers together to read stories, play games, and most importantly, learn more from each other. Last weekend found us at the gates of the school, listening to the chirpy voices of the only other bunch of humans who can be as excited as us about a working Saturday morning – school going children. Citizens School, located on Davis Road, Bangalore, is an English medium school for children from low income families, and has a building for the primary section, and another building down the road for the senior kids. Roopa had chosen to read ‘How Old is Muttajji?’ to a class of 6th graders in the senior school building. This is a story about two enthusiastic twin detectives trying to deduce the age of their great grandmother from various events in her life. And we decided to go along with ‘Same Same or Different’, a story of a sparrow and a snake who try to show their parents they can be friends despite their obvious differences, for a class of 4th graders. In Grade 6th, Roopa had 35 kids on the edge of their benches wondering along with Putta and Putti what is their Muttaji’s real age. Gathered in their ancestral home in Mysore, the twins used History, Mathematics and General Knowledge to come to the exact birthday their great grandmother was celebrating! The kids were amused, intrigued and fascinated by the interesting bits of history spread through the book and the twins’ investment in cracking the clues. After the story, Roopa quizzed the children on Indian history. The class was divided into groups and their knowledge on India’s history and culture was tested. There was a lot of competition and guess work in the air (not to say noise!) and the session ended on a high with all the energy from the children! We projected and read out the story ‘Same Same or Different’ to the very excited class of 4C in a charming library on the sunshine-filled terrace of the school. The colourful characters, the emotions, and the very real problem of your friend not being approved of by your parents, made the story come alive for the kids and us. After some impassioned reactions to the parenting skills of Mama Sparrow and Papa Snake, we moved onto our activity for the day. The kids partnered up with whoever was seated next to them, and were given coloured pens and activity sheets. The activity sheet had a venn diagram, exactly like the one Sparrow and Snake use in the story. 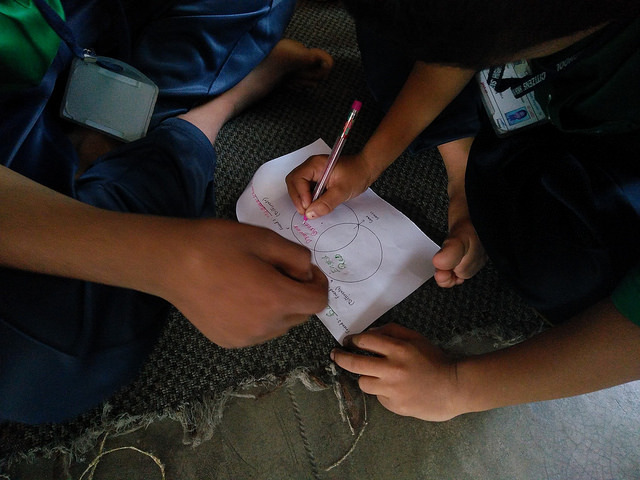 The kids talked to their partners about their hobbies, favourite foods and games and colours, and birthdays, and filled in what was common to both of them, and what was different. We then counted our ‘same-sames’ and ‘differents’ and talked about whether that affected our relationships, and whether that was even an important thing to consider. After multiple photographs, viewings of activity sheets, and thank yous, we ended our session with many learnings on how kids view their friendships and parental relationships. You can see more pictures from the sessions on the StoryWeaver Flickr Account.